Sebastian Petion slumped on the court, wearing a red warm-up top over his team’s school-bus yellow uniform, legs stretched in front of him, exhausted before the championship game even tipped off. The crowd was still trickling into the outdoor arena, which had developed a block party vibe. 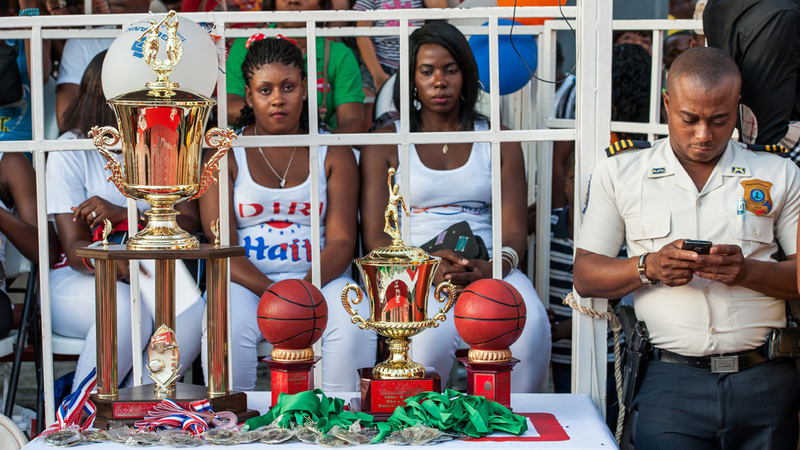 Spectators lingered on the court drinking chilled cans of Prestige, Haiti’s most popular beer, while snacking on dried plantains that vendors sold from baskets carried atop their heads. You could say the impatience came from Petion’s American side. The 6-foot-4 power forward, with broad shoulders and a baby face, was born in Haiti but lived for 13 years in Florida, where he played high school basketball. He dressed for one season at Winthrop University before a broken arm cut his college career short. Now 35, Petion lives in Port-au-Prince, Haiti’s hard-bitten capital, with his wife and two kids. He runs his own media company when not playing for Bongu, one of six teams in the six-year-old Association Haïtienne de Basketball Corporatif, or ASHBAC, Haiti’s most prominent basketball league. Last year, Petion led Bongu to its first title; this year, he was named league MVP. At the other end of the court, Bongu’s opponent, Marché Ti Tony, was going through layup lines. The team belongs to a wholesale goods magnate named Anthony Bennett, or Little Tony — Ti Tony in Creole — who also serves as the team’s player/coach. Bennett, who is one-quarter Haitian but has lived in the country nearly his entire life, looks like a tanned Mark Ruffalo, with graying hair and stubble. He’s a basketball fanatic with a ferocious competitive streak, and he had decided to bench himself for the championship to free up playing time for Marché Ti Tony’s strongest players. Marché Ti Tony was smaller and less athletic than Bongu, but they played a more disciplined, team-oriented style of basketball. As the sun slipped beneath the horizon, the starters took the court. This was a special moment, and not just because the game was finally beginning. Only four years after a devastating earthquake nearly leveled this already poverty-stricken nation, basketball — traditionally Haiti’s second sport — had grown to this. It was an event, featuring skilled players, media attention, sponsors, and fans so passionate they would throw beer cans onto the court when they didn’t like a call. Marché Ti Tony had supporters who screamed players’ names; Bongu had a horn band. As the ref tossed the ball in the air and the crowd roared, one thing seemed clear: Against long odds, Haitian basketball was booming. The entire country of Haiti — population 10 million — has just four courts with roofs to keep out the rain, two outdoor courts made of rubbery tiles that can’t be used when wet, and not a single hardwood floor. The rest are concrete. The country’s two semipro leagues — ASHBAC and the Senior Basketball League — play all their games outdoors. Until recently, there were few organized youth leagues, and young talent isn’t cultivated like it is with soccer, Haiti’s national sport. Most kids don’t have proper sneakers; many don’t even wear shoes when they play. The coaching, when present, leaves much to be desired. Fundamentals like boxing out and shooting layups with their off hands are foreign to many Haitian players. Haiti is the poorest country in the Americas, with about 80 percent of the population living on less than $2 a day. The country is still recovering from the 2010 earthquake, which caused roughly $13 billion in damage, killed an estimated 150,000 people, and left behind still-visible scars including crumbled buildings and missing limbs. The center of Port-au-Prince is tightly packed, with suffocating traffic, tin-roof structures, and dilapidated gingerbread houses, the turn-of-the-century buildings named for their intricate latticework. Joblessness, poverty, and violence, although improving, remain national concerns. But Haiti functions far better than many outsiders think. There are bad neighborhoods and good neighborhoods, shantytowns and thriving commercial districts. There’s a small but growing middle class. Many Haitians are tired of the constant UN presence and wary of foreign aid workers arriving on comfortable expat packages to offer help nobody asked for. In other words, Haiti is not just the country you’ve seen on CNN. Although basketball has been played in Haiti for decades, it didn’t truly take root until the 1990s, when the Jordan-era Bulls became fixtures on local TV. In 2002, a Haitian player named Robert Joseph, who was a senior at Union University in Tennessee, broke the NAIA single-season record for blocked shots (a record that still stands) and was named the league’s player of the year. 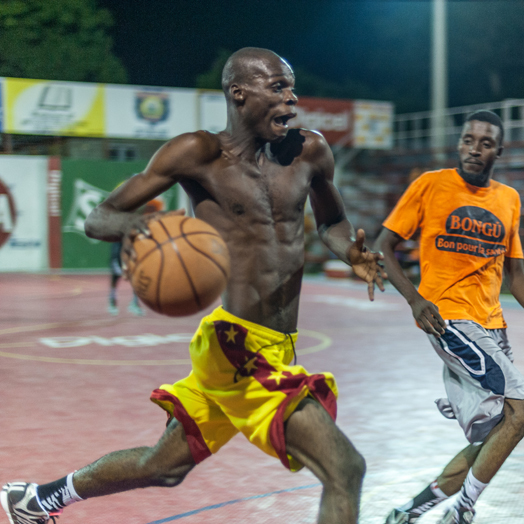 Joseph, who now plays professionally in South America, is a legend in Haiti’s small basketball world and showed young Haitians where basketball could lead. Today, NBA games are broadcast regularly on television. 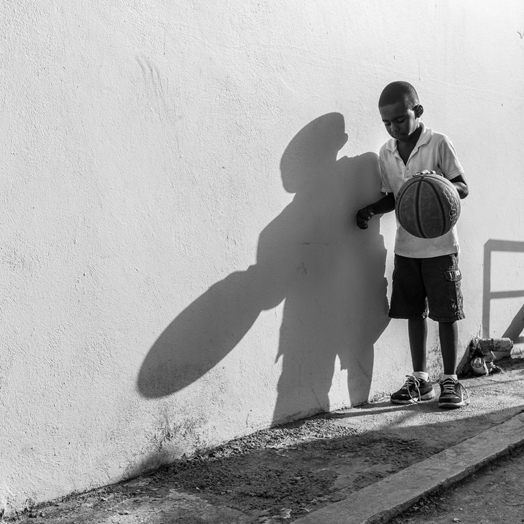 Kids play streetball across the country, and despite the ongoing challenges of poor infrastructure and coaching, Haitians are starting to have success off Hispaniola. Samuel Dalembert, who was born in Port-au-Prince and moved to Canada at age 14, is a 12-year NBA veteran who plays for the New York Knicks. Union University alone has given full scholarships to a half dozen Haitian players. Skal Labissiere, who barely survived the earthquake after his home collapsed on top of him, earned a scholarship to play for a private Christian high school in Memphis, and he has become one of the top college recruits in the country. Schnider Herard, a 6-foot-11 center from Port-au-Prince who plays high school ball in Texas, has offers from the University of Texas, Oklahoma, and Kansas State, among other elite Division I programs. Last fall, I read a short article about a man named Jim Bostic, a community organizer in Yonkers, New York, who played a season with the Detroit Pistons in the ’70s. Bostic, who became a high school and college coach once his career ended, visited Haiti after the earthquake and began collaborating with a local businessman named Jasson Valbrun to build a Haitian national basketball team. I interviewed Bostic and Valbrun and other members of the Haitian basketball community — people like Pierre Valmera, who played at Union and now runs a scholarship program that helped send Labissiere and Herard to the United States. Valmera learned to play basketball on a homemade hoop fashioned from a bicycle wheel nailed to a wooden post, and he eventually turned that determination and raw talent into a college scholarship. The championship game was five days away, and Bongu’s practice had devolved into a shouting match over fouls and ball-hogging. The night had begun with a show of camaraderie. Petion had presented his teammates with brand-new zebra-striped Nikes and matching socks, all paid for by Bongu. (It was explained to me that the shoes were an “expression of solidarity” against Clippers owner Donald Sterling’s racist comments.) Sporting their new kicks, the players went through a lazy arrangement of stretches, layups, and free throws, and then played shirts-and-skins for two hours. The practice was more pickup game than focused preparation. But Bongu clearly had talent — with better coaching, several players looked as if they might have been able to compete at the American college level. One in particular was a star: Alex Elicin, nicknamed “Little Garnett,” was 6-foot-4, cigarette slim, and bullet quick. 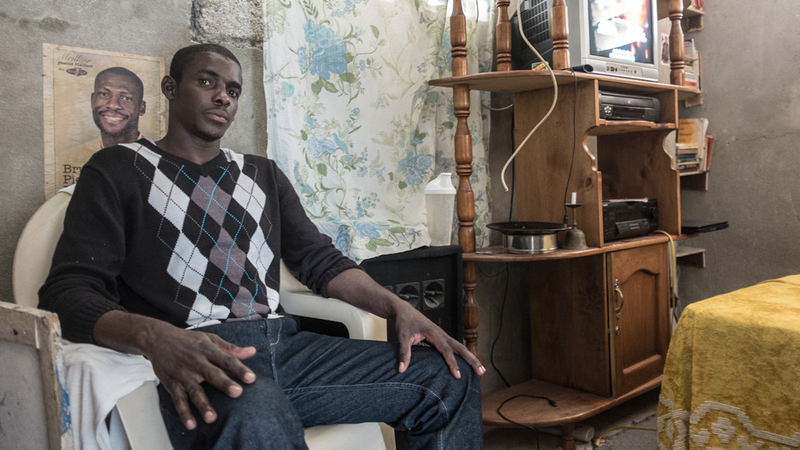 He grew up in Delmas 2, one of Port-au-Prince’s poorest neighborhoods. The 22-year-old Elicin, Petion’s protégé, was Bongu’s leading scorer and arguably the most talented player in the league. Bongu’s coach, a man in his thirties who preferred suit jackets and collared shirts despite the buckling heat, barked instructions to his players that went unheeded. He appeared to be coach in mostly ceremonial terms; it was clear that Petion was Bongu’s gravitational force on and off the court. The players worshiped him. Earlier in the day, I’d met Petion at my hotel, where he shared Bongu’s origin story: A few years back, after attending an ASHBAC game as a fan and noticing the intensity of the crowd, Petion decided he wanted to play. He approached members of Bongu’s senior management, who he knew were interested in sponsoring a club, and convinced them to allow him to build a team. He pitched in some of his own money to help pay the players’ monthly $120 salaries. (Since then, the players’ average monthly pay has risen to around $450.) A friend donated uniforms. 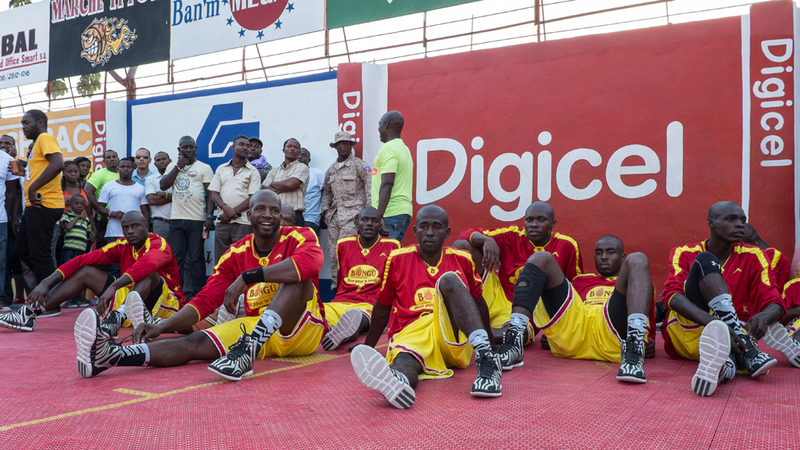 A few months later, Bongu was competing in the championship game against a team made up of Port-au-Prince police officers. By the fourth quarter, Bongu trailed by 17 points; most of the company’s top executives left the stadium. But in the final minutes, Bongu mounted a comeback. The executives were called back and arrived just in time to see their team win the title. The company’s owner gave each player a bonus of $1,000 — a small fortune in Haiti. 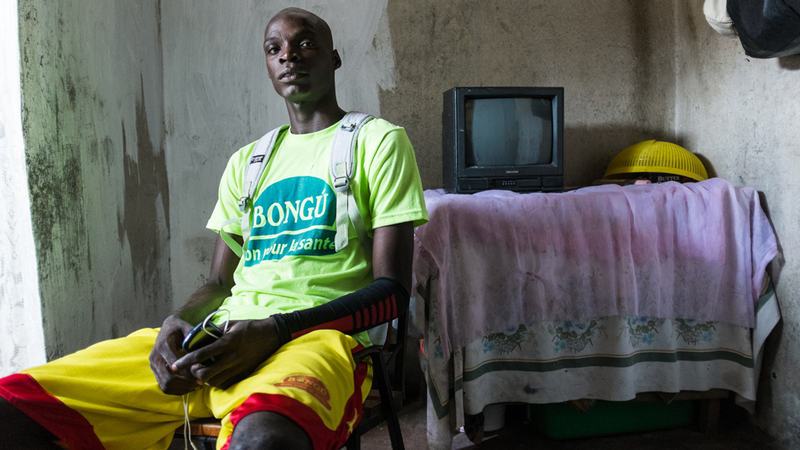 Petion, who had moved back to Haiti in 2004 and works as a fixer for international media (he has worked for ESPN in the past), sees himself as a big brother to Bongu’s players, many of whom attend university or work other jobs. He’s a decade older than most players on the team — their average age is about 24 and the youngest is 19 — and he makes sure they stay out of trouble and keep up with school. He treats his teammates to meals, and he even arranged for the team to stay in a luxury hotel the night before the championship game. Valbrun had stopped by Dadadu to check on a coaching clinic he had organized. Inside a one-story building with no air-conditioning, about two dozen high school and university coaches were learning conditioning drills and basketball fundamentals. Instructors included a Haitian Canadian who ran a college basketball program in Quebec, and Antoine Joseph, a towering 29-year-old from Port-au-Prince who had played at Union and later for the Palm Beach Piranhas in the American Basketball League. The SBL was founded in 2012 and had a promising first year. Valbrun, who helped fund the league, offered a $10,000 prize for the winning team, and games were broadcast live on Haitian television. 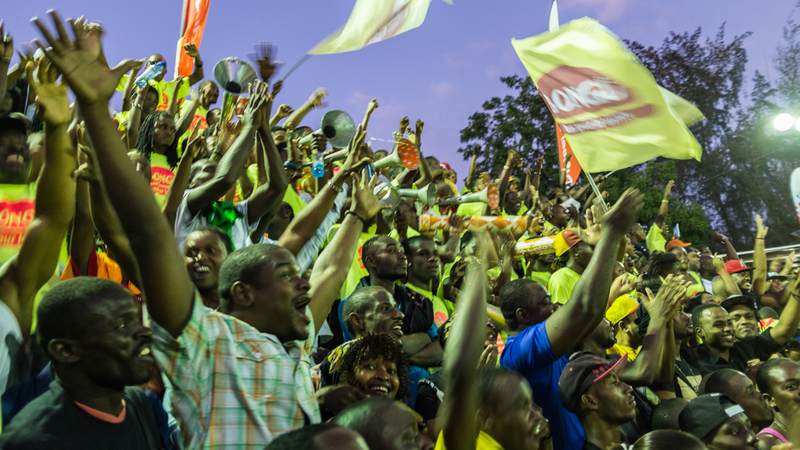 During the SBL’s second year, however, sponsorships dipped, and this year the season had to be delayed several months because the World Cup was expected to dominate Haitian sports fans’ interest throughout the summer. Despite the setbacks, however, Valbrun is optimistic that the SBL will emerge as a true professional league, with salaries high enough that players won’t need to find work elsewhere. We walked from the classroom to the nearby outdoor court. There, Joseph led the group of coaches through some basics: triple-threat position, jump stops, dribbling exercises. He taught in a mix of English and Creole while a group of curious onlookers circled the court. Basketball in Haiti is still a grassroots phenomenon, fueled by boosters like Valbrun and ASHBAC founder Emmanuel Bonnefil, as well as businesspeople with deep pockets and a passion for the sport like Marché Ti Tony owner Anthony Bennett. One morning, Valbrun drove me to an industrial area near the Port-au-Prince airport to meet Bennett at his bustling warehouse. His office was cluttered with basketball awards, including Ti Tony’s 2011 ASHBAC championship trophy. That night, I watched Marché Ti Tony practice on the same outdoor court where Bongu had scrimmaged the night before. The contrast between the teams’ practices was stark. Ti Tony began with a team meeting led by George Feguens, a 29-year-old forward with a shaved head and an intense demeanor who partly grew up in Florida. When Ti Tony took the court, they ran drills at full speed, with Feguens shouting instructions in Creole. Even when the sky broke into a torrential downpour and turned the court into a skating rink, the players shot free throws in the rain. If discipline and fundamentals were lacking in Haitian basketball, it wasn’t because of Marché Ti Tony. 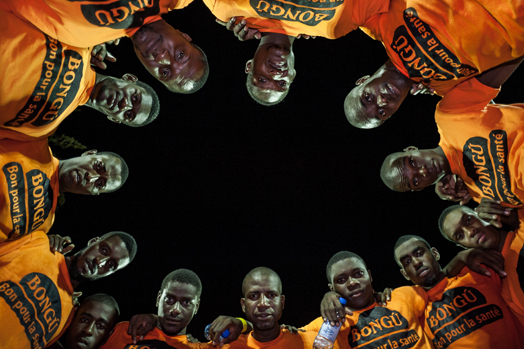 Two days before the championship, Bongu’s players had their heads shaved. It was for team building, Petion said, another show of solidarity. They had just finished a morning practice, and as they waited in the shade outside a busy barber shop, they listened to Haitian rap from one of the player’s cars and sipped on dewy bottles of Guinness. After the haircuts, team Bongu stopped by a supermarket cafeteria for a lunch of bacon-and-cheese sandwiches. The players used their phones to post pictures of their newly shaved heads on Facebook. They told jokes and tried to get numbers from girls at a nearby table. They could have been a team in the United States, the Caribbean, anywhere. They were what Petion had hoped they’d become: family. Groups of men slept in the shade; a few goats meandered across the court. It was here where, at 15, Elicin started playing basketball. It was here, too, where Elicin experienced the 2010 earthquake — running a fast break, he stopped in his tracks, terrified, unsure what was happening. He and his family weren’t harmed, but several of his friends from the neighborhood were killed. 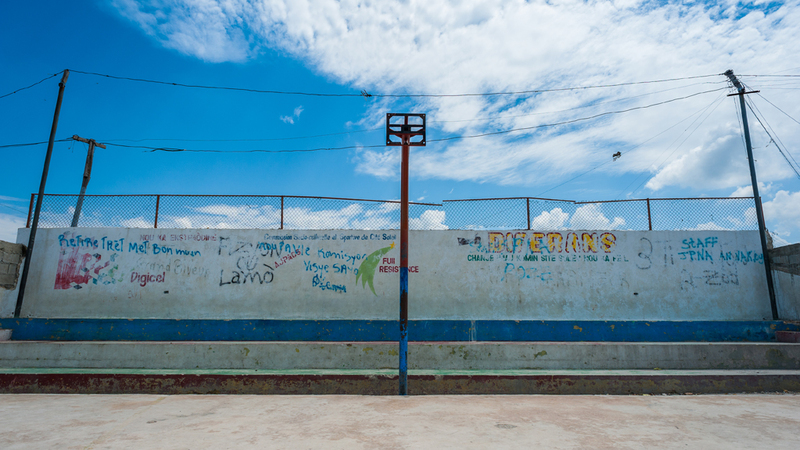 We walked back through the stadium and across the street into a narrow warren of tin-roof homes where Elicin grew up and still lives with his parents and siblings. His house consisted of three brick-and-concrete rooms, with tiny windows and no fans. Elicin’s room was in the back, maybe 7 by 10 feet. Basketball shoes were laid out on the floor, and medals hung on the walls. Last year’s ASHBAC championship trophy was placed on a bedside table. Kids played in the alley outside; we could hear a baby crying somewhere nearby. Elicin is still in high school. (Because most schools in Haiti are tuition-based, many students attend only when their parents can pay. As a result, some, like Elicin, don’t finish until their early twenties.) He hopes to earn a basketball scholarship to attend university in Port-au-Prince next year. I asked him what he wants to do after basketball. “Accountant,” he said. To earn money, his family sells a few items from a wooden box placed in the alley outside their home: candy, toothpaste, sardines in tomato sauce. I picked up a can of sardines and noticed the brand — Bongu. The next afternoon, Valbrun took me to meet Evens Gedeon, Marché Ti Tony’s 32-year-old shooting guard and star player. We picked him up in downtown Port-au-Prince, where the earthquake damage is still pronounced. Gedeon was waiting for us outside a print shop, where he had dropped off photos of himself playing basketball to be blown up into posters for his wall. Despite the 90-degree heat, Gedeon wore a black sweater and jeans. As he slid into the backseat of Valbrun’s truck, sweat dripped down his face. Outside downtown, off a busy street and across from a gas station, Gedeon showed us his home, a series of dimly lit but spacious rooms where he lives with his girlfriend and a few family members. Next door is a small restaurant where Gedeon and his girlfriend sell beer, fried plantains, and basic Haitian dishes. We sat at a table and Gedeon played a highlight reel of himself on his laptop. He pulled up a photo of himself and Samuel Dalembert, who has coached at camps in Haiti. Gedeon played soccer when he was young, but he fell in love with basketball as a teenager and never looked back. He starred for his university team and counts as a career highlight playing in a tournament in the Dominican Republic — his only trip outside Haiti. Before his playing days are done, Gedeon has one more dream he’d like to see fulfilled: to play for a Haitian national team. In September, there will be a vote for a new director of the federation, which Valbrun says is the next step for creating a national team. Pierre Valmera, meanwhile, is recruiting players through his scholarship program, and Jim Bostic is raising funds for a national training facility. Currently, there is none. This is perhaps like comparing a bazooka to a peashooter, but for its part, the U.S. national basketball program is building a $350 million facility in Tempe, Arizona. The noise was deafening: cheers from the crowd, the horn band in the stands, DJ Jeffie’s unpredictable beats. The first quarter of the ASHBAC final was fast-paced, the players alternating between out-of-control and fatigued. By halftime, Marché Ti Tony had claimed a 10-point lead and Bongu looked resigned to defeat. They committed turnovers and yelled at one another in frustration. They complained about every foul call. They missed free throw after free throw. Midway through the third quarter, Bongu was down 16. But in what looked like it might be a repeat of last year’s championship, Bongu mounted a comeback. As they cut Ti Tony’s lead to single digits, Petion took control of the game — bringing the ball up the court, shouting directions at his teammates, scoring two quick buckets on hard drives to the hoop. At the beginning of the fourth, Petion sat on the bench for five minutes. I assumed he was in foul trouble. After he subbed back in, Bongu whittled the lead to one. With less than a minute to play, Bongu blocked a Ti Tony shot as the shot clock sounded. Elicin — Bongu’s star, who had struggled all night — tore down the court and caught a long pass in stride. He went up for a layup and was mauled by a trailing defender. The Dominican ref called a flagrant foul and the crowd erupted in competing howls of approval and fury. Bongu was down one point with 9.6 seconds left and their star player — the league’s best athlete — was at the foul line. Two shots. Alex Elicin — Little Garnett — missed both. Bongu had one last chance. Elicin caught the ball on the inbound, took one dribble, slipped, and turned it over. As the buzzer sounded, fans rushed onto the court and circled Ti Tony’s elated players. Confetti flew. Music blared. At the other end of the court, Bongu’s players were in shock. What just happened? Elicin sat on the court, legs splayed, head down. On my last day in Port-au-Prince, I went with a photographer friend to Cité Soleil, the city’s worst slum. The area was widely considered to be one of the most dangerous neighborhoods on earth. It’s ruled by gangs; poverty is endemic. But things have improved in recent years, and throughout my visit to Port-au-Prince I’d heard about a fledgling basketball league in Cité Soleil. There was also a basketball court in the center of the slum that had been damaged in the quake. Against the advice of pretty much everyone I had met in Haiti, we decided to check it out. I looked back and saw two men in muscle shirts walking toward us. I turned around and kept moving. As our guide grabbed my arm to stop me, I thought, What the hell have we gotten ourselves into? I faced the two men calling for us. One of them was carrying a stack of papers. He handed me a sheet. It featured a photo of a dozen or so young men in gold uniforms, posing in front of a glass backboard and net. Mekredi, 7 Me, 6:00 PM. It felt surreal: We were in one of the worst neighborhoods in the Western Hemisphere being invited to watch a basketball game. These guys had no idea we were interested in the sport — they just wanted to let us know it was happening. The man tapped the sheet. “Demi-final,” he said. The episode spoke volumes about what was happening with basketball in Haiti: two semipro leagues; thriving high school leagues; skills camps for street kids; a scholarship program to send the most talented players abroad; and a community league in Cité Soleil. And almost all of it has happened after the earthquake, an event that by many accounts marked Haiti’s ruin. Mitch Moxley (@mitch_moxley) is a writer and editor in New York and author of Apologies to My Censor, about his six years living in China.